What a contrast to the rain and snow of yesterday. We had a lot of sunshine for our first day skiing at Crans-Montana in Switzerland. It was actually my second time skiing the Crans-Montana area as I had a 5 day ski mountaineering trip starting above Sion in 2000. We were blown off Arpelistock, then skied the Wildhorn, Wildstrubel and Schwarzhorn, all 3000m peaks in the Western Bernese Oberland north of Crans-Montana. 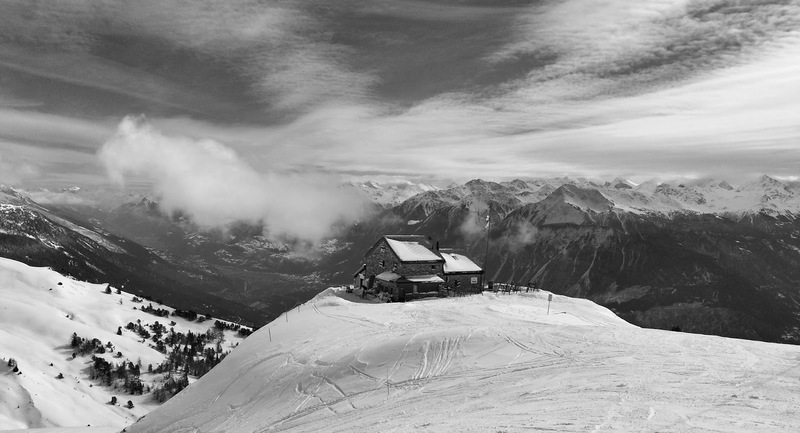 Our descent from the Schwarzhorn took us down to Aminona, part of the Crans-Montana ski area. However, today we started in Crans and worked our way over towards Aminona. The skies were a little cloudy at times but continually changing. I took a couple of rolls of Ilford FP4 120, that’s 20 shots, during the day. Here’s one of the Violettes Hut. I took quite a few of this on my Mamiya 7 camera and red filter as the light and clouds changed. The shot here was taken on my phone and edited with Snapseed to give you an idea of what I took on the proper camera. I’m planning to ski without the camera tomorrow as snow forecast on and off all day.